Release day ‘Quarterling!’ And I was interviewed about it. Today my new book goes life! If you haven’t already pre-ordered it, here is your chance to get the e-book on your Kindle app or convert it to any e-book of your choice. This is the direct link: Quarterling You can also read a sample there. I am a Sky Whisperer. I want to say I don’t believe it, but that would be a lie. I had always known that I was different, despite constantly trying to fit in. Terribly failing at it, of course. But despite everything, never had I imagined something like this. Somehow I wanted things to be like they were before. I guess it felt more familiar, and it was easier having the reputation of ‘WindTaker’ than being a Goddess. Well, I wasn’t one, or at least not yet, Xenthia had told me. That took some time and acceptance. I also never received any training or former knowledge of anything but being a simple village girl who worked in a bakery, making paper flowers in her spare time. But I was more than that now. I was happy about that at least. What did Xenthia want from me anyway? By telling me this? What did she expect from me now? To perform a miracle? I didn’t in the least feel that I had any powers. Join them and leave my old life behind? At first I presumed she came to me so that she could give me some answers about the disappearance of the wind. And then later, when she told me the story of my birthparents, I started to suspect she somehow had other things in store for me. It wasn’t just answers she was giving me. I felt like she was teaching me, preparing me, and I slowly started to think she somehow needed me. Perhaps she needed all of the Sky Whisperers’ help to generate wind, and she would train me so I could be of value to them. I was wrong. She had bigger plans for me. Much bigger plans. Why did I write ‘Quarterling’? 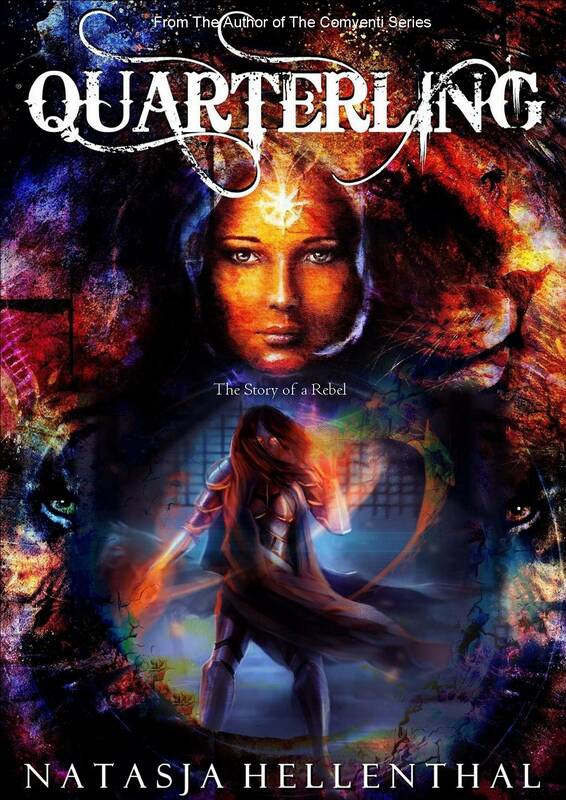 You may or may not know that The Comyenti Series, from which ‘Quarterling’ is a part of being a spin-off novel, is a fantasy series that as a whole is really close to my heart. It always has been, more so than all my other books. Being a huge animal lover, vegan, and empath myself writing about an alien humanoid species, who are all mind-speaking empaths, and have all these amazing animal abilities, but with their own weaknesses comes almost natural to me. That probably shouldn’t come as a surprise for those that know me. Especially since most of my life I have almost felt like an alien on this world myself! Being sensitive to noise, bright lights, strong smells, fainting in crowds, wanting different things in life than others my age, reading different books, being vegan, and lesbian! I am also quite a private person, so I guess not many people know much about me at all, hence why I started this newsletter in the first place. But, I digress. All of the main characters certainly feel like different parts of me I wanted to explore. Especially Sula Comyenti who started it all in book 1: ‘Call Off the Search’ which was originally called ‘Small Sacrifice’, and who has been with me from the start shaping the story and series with me, always insisted in getting heard. For a writer it is almost impossible not to listen to those voices in your head! They won’t leave you alone until you write their stories down. No, you are not insane, you are a writer. That is our excuse, at least. Still, I just love writing every book that is either part of the series or a spin-off story such as Quarterling is, so I really don’t mind. Besides, Sula is always great company.It became clear to me though that after writing the first two books the characters had much more to say and to do before I started writing book three. I knew I just couldn’t fit it all in without losing the main thread of the book and for the readers to lose the plot. These characters, once an adult, deserved each their own story, their own novel. And that is what I am doing. That is the plan at least. Sula has five children so they all get their own book, some even more than one. There are three so far and a fourth is in the making! There is ‘Chained Freedom’ (Free download here: https://www.amazon.com/Chained-Freedom-Comyenti-Natasja-Hellenthal-ebook/dp/B00IK4OWXE/ ) in which Fay had a brief appearance, but she was only really a side-character like in book 1 and 2, not a main one. So she kept insisting on telling her own story! Her voice grew stronger and louder. I had already told Aigle’s story in ‘City of Dreams’, or at least one of his stories, and I felt it was time for Sula’s first born Fay to really tell hers. Beside it being a coming of age story and one of unrequited love, and just about being young leaving home for the first time, I have been toying with the idea of writing some of my own experiences down. The things I have witnessed whilst living in Norway, Wales, and the South of France especially have always stayed with me. The animal cruelty and accidents whilst I was out hiking mostly. I wanted to share these experiences with my readers and what better way than through a story? They say, write what you know, and that is what I have always done. I have changed the facts around slightly as in my case I was mostly too late, but not always. Once I did save a nearly drowned sheep from a freezing, roaring river, and one bird out of a football net, but found another sheep dead with her head stuck in a fence and other sheep washed ashore. These images never left me. The rat I saved two years ago still lives with me as I couldn’t find a surrogate mother. Fay reminds me slightly of myself when I was seventeen. Full of big ideas, hopes and dreams, and that life isn’t always how we plan it to be. Love isn’t either. It can come in various forms and may not be what we imagined it to be. Fay started to tell me her story from the time she left home. It was easy to let her live some of my own experiences and see what she would have done, with or without her super powers. And how I would wish I had those powers often! But then again, she is restricted in some ways. How? Well, you will just have to read the story. Speaking of superpowers though, especially a female superhero, saving animals, not people this time, was needed, desperately I felt. I have researched but only found one or two other books with a vegan superhero, but they were all for children… Why, I wonder are animals always associated with children or children’s stories? Don’t adults love animals? Do we outgrow them and their cuteness? Don’t we want to read about their happy ending? Adults love their pets, but often can’t extend it to other animals. Most don’t want to think about the suffering, the exploited animals, at least not enough to want to save them. Vegans do. Luckily. Thus a story was born. Fay was going to be a superhero for the animals with an older audience, okay young adults more precisely as she herself is only seventeen when the story starts, but still, it’s a start. I do hope to reach a broad audience with Fay’s story. That is why there are many more subjects thrown in: coming of age, parents, adventure, romance and a touch of magic. Well, I won’t ramble on too much as this should just be a little post about what made me want to write ‘Quarterling’. Whilst writing I did try to have an audience in mind. I can imagine other vegans want a hero they can relate to or look up to, so it is for them to have a story to feel at home in without too much violence or visual content. But is still is a story about animal activism and what we can all do, or can’t and about hoping to change people, but how? And if we can, should we and to what ends? There are many questions of a deeper nature. Of right and wrong, of grey areas, and that even if we have certain powers there are even more powerful forces at work we cannot always control, and we find ourselves powerless. It’s a story of wanting to save the world, of change both in and outside of us, of being different and finding our way in the world, of acceptance, of having responsibilities and what it means to be an adult. And I also hope to reach those hearts that haven’t quite made compassionate choices yet. For those who say they love animals. Who knows what changes they will make? One can always hope. ‘We’ve never been captured,’ Zemandu answered calmly, unaffected. ‘You can fly, you are immensely strong, you can make fires like I can, and you can communicate with all these anima—’ ‘Argh,’ Fay grunted. She had seen all that? How had she let this happen? Cover reveal and book launch ‘Quarterling’ count down! I have been super busy writing my latest novel ‘Quarterling’ which is now in the final stages of editing! The cover reveal is attached and I am thinking to release it within 2 weeks’ time, so stay tuned for the exact date! Seventeen-year-old Fay Comyenti has it all: lots of freedom, great parents, a budding romance, and super animal abilities most teenagers can only dream of. Only, those powers have to be kept a secret in order for her kind to stay safe. After being rejected by her love interest, Elodyn, Fay leaves her village to do some good with her skills in the world despite the concerns of her comyenti mother and human father. Even so, she is determined to use her powers to help animals in need, but that’s not always easy without anyone seeing you . . .
Zemandu, the last of the tracar people has been following Fay from a distance for a good reason. The demoness is dying. Attracted by the girl’s altruistic mission, her abilities and her benevolent energy she sees Fay as her last hope. When Fay and Zemandu — two powerful women of a very different nature, yet both the last of their kind — cross paths, they’ll forever change the course of humanity, but at what cost? Will Fay risk losing her heart and her innate empathy to the demoness — the very characteristics what makes her a comyenti in the first place —without jeopardising her vital mission? Follow Fay and Zemandu in this animal-loving, suspenseful dramatic YA novel which is a full stand alone spin-off novel from the popular Comyenti Series. Fionnuala and her brothers lead a magical, carefree life in the emerald Tuatha kingdom of Lir in ancient Ireland. But when their mother dies in childbirth their world is turned upside down. Left heartbroken, King Lir locks himself up in his bedchamber, leaving the children to fend for themselves. Fionnuala, old enough to leave and marry, takes it upon herself to care for her younger brothers. But then little Conn falls ill. Feeling betrayed and hurt the princess has great trouble accepting this, but she doesn’t know the truth of the real reason why Aoife agreed on marrying the king. Will the two women find a way to be together, or is a jealous king going to stop them? Suspenseful, romantic and seeped in Irish myth and magic, ‘The Cursed’ captures a dramatic adult lesbian-fairytale twist on ‘Lir’s Children’ and the power of love, hope and patience.